In the village of Zadlaz-Čadrg you can taste local dairy specialities at the summer garden ‘Pr Jakču’, which is only a kilometre away from the famous Dante’s Cave. Here you can enjoy the taste of cold cuts and cheese platters, boiled potatoes with salted ricotta, a local dish called frika and polenta, and homemade strudel with cottage cheese, apples and nuts. You can quench your thirst with homemade elder juice, or try our special homemade schnapps. The summer garden is open all summer and can accommodate up to 30 people. For closed group, please make a reservation in advance. 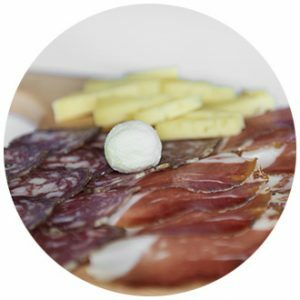 The best homemade meats from our local farmers. 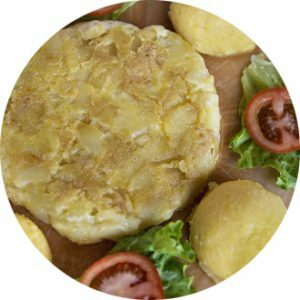 The best frika (Potato – Cheese) in the world. We can offer you a refreshing cup of homemade elder juice or the best drop of spirit in the valley.